News was received of the passing of Ardis Butler James on July 7th in Stamford, Connecticut. 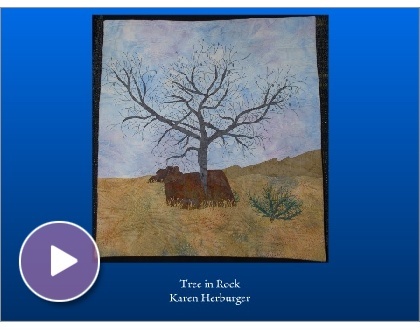 She was one of the greatest ladies of the quilt world. She and her husband, Robert, were to be inducted into the Quilters Hall of Fame at the Marie Webster House in Marion, Indiana, July 16, 2011, for the Quilters Hall of Fame’s annual celebration. Ardis passed away before the event at age 85, and, as a result, her life was celebrated during the Induction Ceremony . Ardis and Robert have done so much for the quilt world with their quilts and promotion of quilt history and the formation of the International Quilt Study Center and Museum at University of Nebraska, Lincoln, in 1997, where there are currently more than 3,500 quilts. The Center has the largest public quilt collection in the world! When the James’ established the Center, they donated almost 1,000 quilts from their personal collection. Presently the Center has nearly 1,100 of their quilts, both antique and contemporary. A friend informed me of QuiltCalc which is a smart phone app that includes this kind of help plus more, and it’s free! She highly recommends QuiltCalc. QuiltCalc helps calculate yardages for top, backing and batting. The app has a section on yardage for piecing, binding, border yardage, square within a square, and set-in and corner triangles. It even tells you how big a square to cut to make half square triangles! How convenient is that? You can have the app on your phone with you, as you shop. That has to be the best. Now, for me to just get a smart phone….. 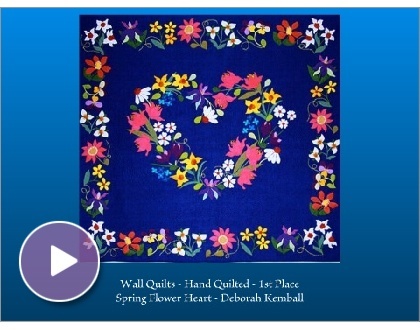 The slide show is presented by Smilebox from The Quilt Show. The Studio Art Quilt Associates (SAQA)is showing “Sharing Stories: Expressions and Stitched Meanings” at the Front Porch Gallery in Carlsbad, California, from July 9 – September 4, 2011. Photo is the Gallery’s.